Daytona, Fla., Jan. 25, 2017 – 24-year-old sportscar driver Michael Johnson and teammate Stephen Simpson, JDC-Miller Motorsports, are kicking off the racing season with an endurance challenge in the sunshine state. 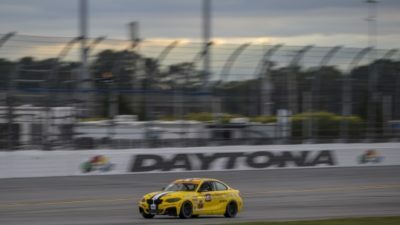 The paralyzed driver and his team are taking on the BMW Endurance Challenge at Daytona, an IMSA Continental Tire Sportscar Challenge race that’s four hours long and offers fans the chance to watch their favorite drivers prepare for the Rolex 24 at Daytona in the years to come. Johnson’s car is specially-designed with hand controls for braking, shifting gears and manipulating the throttle, due to the driver being paralyzed from the mid-chest down. Because his car has to be specially modified, he was unable to compete on the 3.56-mile Daytona track last season, as it wasn’t ready in time. The 2017 Continental Tire Challenge season opens at Daytona International Speedway on Thurs., Jan. 26, with practice at 9:00 a.m. and qualifications at 5:30 p.m. The race takes place Fri., from 12:15 to 4:15 p.m. The season will conclude Oct. 4, 2017, at Road Atlanta in Braselton, Georgia, which will complete a 10-race schedule.